Help a terrible person finish his terrible novel. Or not. I've just finished Bucket Detective, a disturbing, gross, and occasionally pretty funny first-person adventure from Jesse Barksdale, creator of the similarly dark and comedic freebie The Static Speaks My Name. It's a bit like The Stanley Parable or Dr. Langeskov, in that it's a short first-person game with multiple endings and plenty of things to interact with (including limb-severing machines). There's no in-game narrator, but there is a well-delivered audio tour, along with an optional director's commentary by Barksdale himself. Bucket Detective puts you in the role of a repellent and stupid man who's determined to write a novel, but not so determined that he's willing to finish it himself. Instead, he turns to a mysterious cult, who will grant his wish in exchange for his arriving at their HQ and following the many and bizarre instructions given to him there. There's some truly horrible subject matter, and a bit of gore, but also an assortment of wonderful illustrations, a great script and a memorable soundtrack. 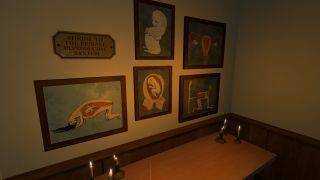 And thankfully, with five endings on offer, you don't have to follow the cult's instructions to the letter. It's not a long game—one playthrough took me about 40 minutes—and I think after your first, you'd be intrigued enough to play again to unlock the others. It's also very cheap, asking for just £2.79/$3.99 of your hard-earned money. You can find Bucket Detective on Steam here, or on itch.io here, and I've put the trailer below.